Liquid facelift is basically a non-invasive alternative to surgical facelift in which advanced dermal fillers are injected into the skin for achieving similar results. The objective of the procedure might be either to give a ‘lift’ to the whole face or simply shape up certain facial features (forehead, eyes, cheeks, lips, chin, and so on). It usually depends upon the requirements of the patients. The method of liquid facelift involves insertion of certain dermal fillers (Juvederm, Restylane, Sculptra, Radiesse, Perlane, etc.) as well as other injectibles (Botox, Dysport, etc.) into the skin for plumping up various parts either by restoring the lost volume and filling the hollows or simply by assisting the body in its natural collagen production. As a result, the skin gets rid of signs of aging, becomes firmer and looks rested. At first, the targeted areas of the skin are made insensitive by performing local anesthesia, applying topical anesthetic cream or simply pushing a numbing injection. Now, fillers and injcetibles are inserted into those specific areas by using different needles. The entire procedure takes less than 1 hour and no pain is felt due to the anesthetic approach. The process of liquid facelift needs minimal to no downtime. Some people may experience temporary side effects like inflammation, redness, bruising, soreness, etc., which can be healed successfully by OTC drugs or ice packs. From subtle changes to complete uplift, the liquid facelift can truly offer a wide range of results. The initial outcomes become noticeable right after undergoing the procedure, which improve gradually with time. 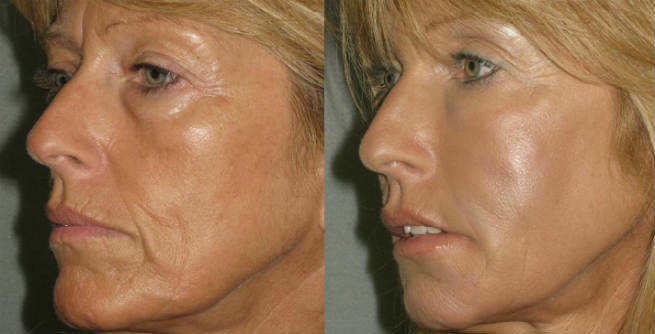 The effects of liquid facelift generally last from 1 year to 2 years depending on the type of filler used. However, it can be extended a few more years by going through touch-ups every 6 months. Like all other cosmetic procedures, liquid facelift also comes with a few potential risks. These include baggy eyebrows or eyelids, small protuberances beneath the skin, infections, and so on. The cost of the procedure is majorly based on the types of filler as well as the number of syringe used. Both of these factors may vary from person to person. However, in general, the liquid facelift may cost you anywhere between $2,000 and $3,000.